Mr. Bullar begins the series with a look at Japanese tools as well as pointing out that a person can execute these joints with traditional western tools. Let me say this, there is nothing magical about Japanese tools. They are just tools and are solely dependent upon the skill of the user. Now I’ll admit that their exotic nature is what first drew me to them. The quality of the steel and ergonomics is what really hooked me. The Japanese chisels and saws I absolutely enjoy using. The kanna (plane) however, I’m not that enamored with. More of a short coming on my part than of the tool. Of that I am certain. The joinery portion of the series focuses on the actual joinery regardless of the tools used to create them. Enough of that tangent. Mr. Bullar then continues the series by introducing categories of joints and showing their construction. Mortise and tenon, corner, right angle and splicing joints have been covered thus far and all are quite applicable to furniture construction. Even if your interest is not in Japanese style furniture, the joints can be adapted to several other styles. At the very least the series will expand your thinking as to ways wood can be joined together. 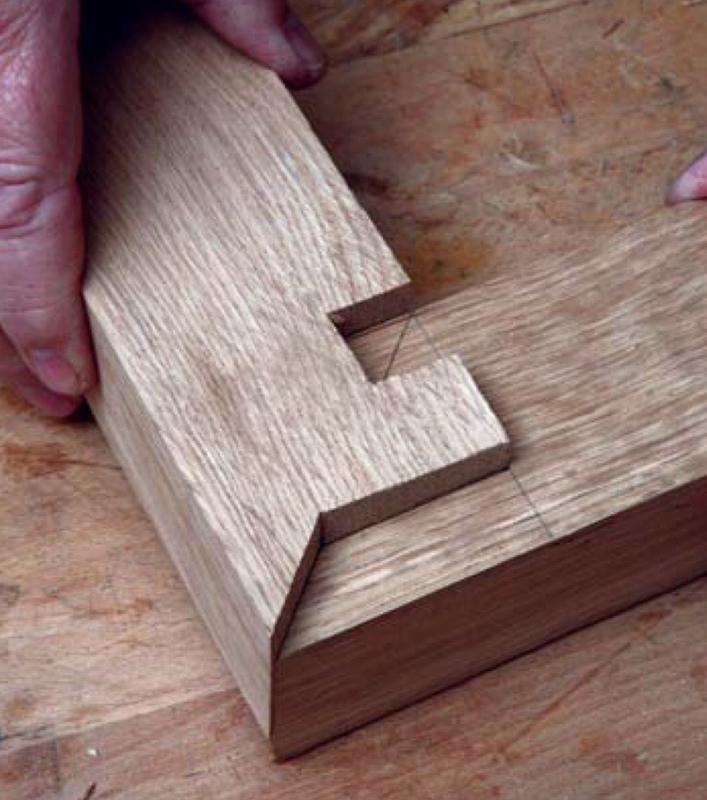 The joinery examples in the series can be challenging. Working thru and building samples of these joints, however, can help to improve your layout skills and cutting accuracy. Ultimately improving your projects regardless of whether or not you actually use these specific joints. I’ve quite enjoyed this series and look forward to the next installments. The only quibble I have is that there is little information as to the actual layout of the joints. There is more than enough information to get you started, but I would like to see the process for sizing and proportioning the elements of each joint. Just a small detail that I would like to see added. This is my first look at Furniture & Cabinetmaking magazine as well and I have found the other topics covered equally informative and enjoyable. This series and the magazine as a whole are well worth a look. *all photos property of Furniture & Cabinetmaking magazine and used with permission. 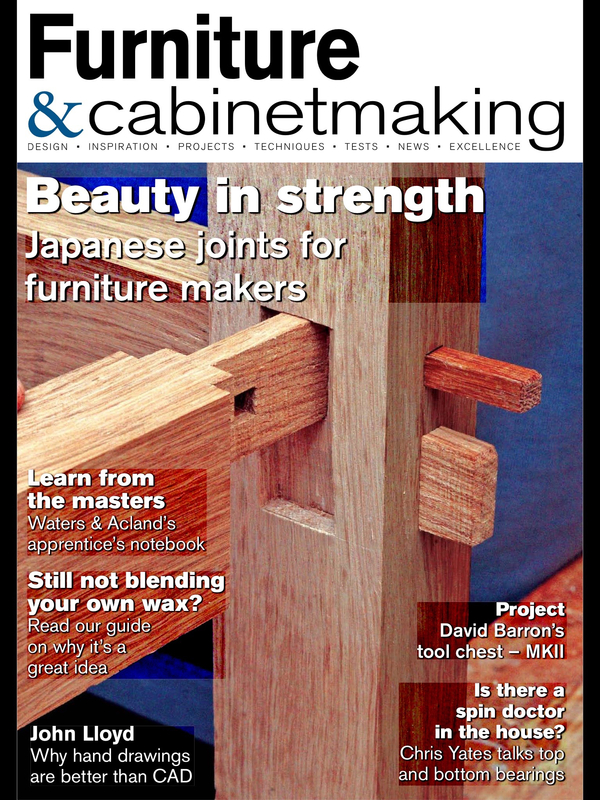 This entry was posted in Thoughts-Views and tagged furniture and cabinetmaking magazine, japanese joinery. Bookmark the permalink. woohoo, more woodworking magazines for the bus ride. A nearly lost art. 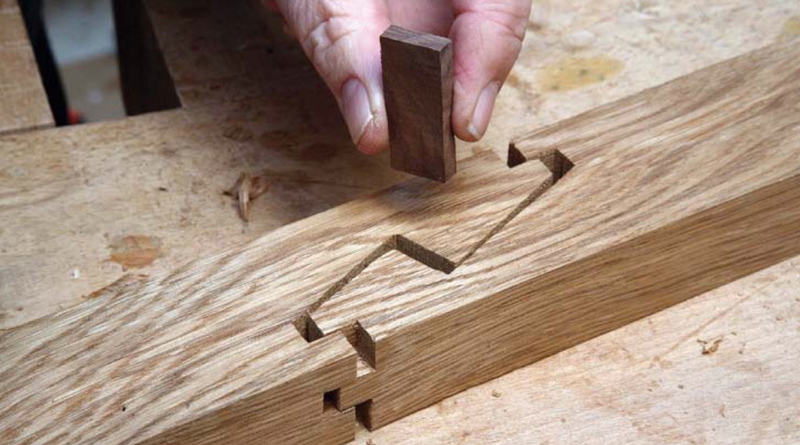 Thanks for posting this great connection to Japanese joinery. It would be interesting to see a practical use for scarf joints in furniture. They can be seen in the continuous curved arm of Chinese chairs. I have cut that particular scarf a number of times in timber, usually on wall plates and with a much longer slope. We have one in 2×2 stock that has been taken apart and put together countless times, by kids and adults alike. One note: if the outer surface of the cog is made with a wee bit of slope, there’s some possibility for adjustment there. Laid out dead parallel to the timber face, it stays in that plane, as do the timber faces, even though the sloped faces and abutments can be pared down for a better fit. The scarf joint is limited in furniture applications. Like you said, it’s mostly used to join long curved sections. The only other applications would either be as a decorative element or to solve an assembly issue. Also possibly to utilize a particular piece of timber, but that would fall under decorative I suppose. I think their can be practical, though limited, applications for the scarf joint in furniture. Such as; a dining table stretcher. Greg, I’m loving your blog! Beautiful work. Agreed…and I’m glad you are enjoying what I’m posting. I like Japanese furniture and joinery very much, I’m not crazy about their tools except for their chisels as they are true masters of metal work but since David Charlesworth did a comparison between Jap chisels and the LN version of the Stanleys and made a claim that there were no differences between the two as they are equal in quality my desire to own a set dropped. However one day I plan on studying their joinery as it is quite remarkable. It’s amazing how they developed these skills. I’m not quite your century it was but nails were very expensive in Japan so they worked on inventing new methods joinery which they evidently became masters of. It is quite remarkable how man can devise new methods of application when he has very little to work with. What drew me to the Japanese chisels is the balance and the ability to use a steel hammer. The standard Japanese bench chisel is shorter than the European counterparts and the blade is shorter as well. I find the balance much more to my liking. I also prefer to use a steel mallet when chopping. Again, I just find it more comfortable and feel that I have much more control over the amount of force introduced to the chisel. The steel is excellent and takes and holds an edge very well. I have not compared them to anything other than my Narex chisels. The Japanese chisels that I own have better steel than those, but not enough of a difference to simply choose one over the other based on steel quality alone. My focus is on the ergonomics. It also amazes me how I make so many mistakes when I’m writing. I love the Japanese joinery there chisels and about there techniques of handling joineries. The First picture after the magazine cover, the miter joint, what is that one called? I do a lot of miter joints and want to see if I can use that one. Thank you. What is the joint called on the second picture? i woul lik to use it on my exam but i’m still figureing it out what the best way is to make this kind of joint. Can you or someone else give me some tips? It is a modified version of a keyed Japanese scarf joint. A Google search should give you more than enough to go on. It is a common enough joint in timber frame construction no matter the nationality. Lots of variations can be found of this joint, as well as some instruction. Good luck on your upcoming exam. I have enjoyed the article but where do I find the rest on how to actually make the joints? WOW, it is wonderful skill, if we can do by ourselve.